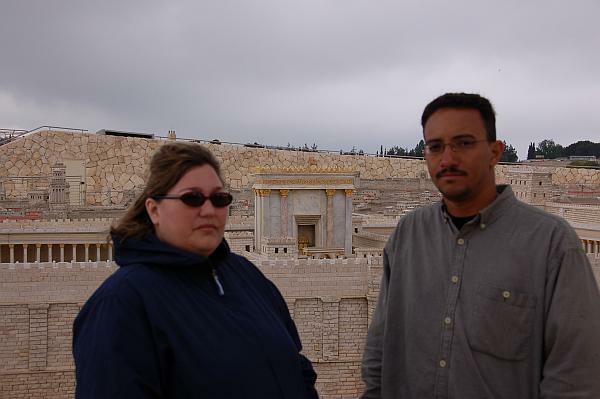 The Shrine of the Book houses one of the most exceptional archaeological finds of history: the Dead Sea Scrolls. Discovered in 1947, the Dead Sea Scrolls contain all of the Old Testament with the exception of the book of Esther. The museum also holds other rare ancient manuscripts and displays The Aleppo Codex. The shrine is built as a white dome, covering a structure placed two-thirds below the ground, that is reflected in a pool of water that surrounds it. It took me a while to figure it out, but it’s designed to look like a large clay jar – the kind of jars in which the Dead Sea Scrolls were found. Walking around it made you feel really immersed in the experience. And also made you dizzy and disoriented. Its dome, due to the quirky architecture, has been used as scenery for several science fiction movies. Across from the white dome is a black basalt wall. The colors and shapes of the building are based on the imagery of the Scroll of the War of the Sons of Light Against the Sons of Darkness, whereas the white dome symbolizes the Sons of Light and the black wall symbolizes the Sons of Darkness. I think I’ll need to read up on that. As the fragility of the scrolls makes it impossible to display all on a continuous basis, a system of rotation is used. After a scroll has been exhibited for 3-6 months, it is removed from its showcase and placed temporarily in a special storeroom, where it “rests” from exposure. No cameras were allowed inside. Bummer. But cameras were allowed outside. And it’s a good thing, too! 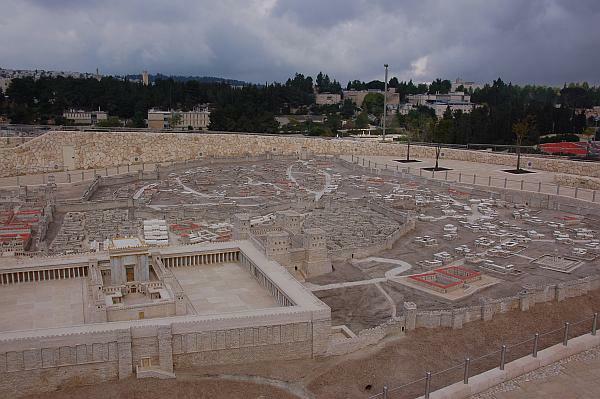 Outside of the shrine is the largest scale model of old Jerusalem. The detail is stunning! The thing is over 100 feet in diameter. Maybe larger! I considered making these three photos into a panorama, but getting the large image to display nicely on a website would have resulted in a loss of detail.This is the view one sees from the Mount of Olives, looking westward at Jerusalem. 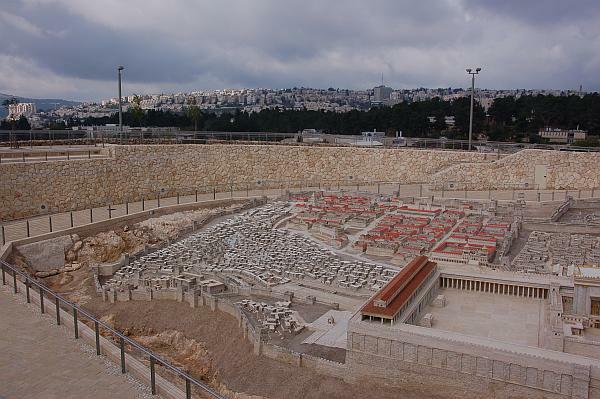 On the far left, you have the old City of David. 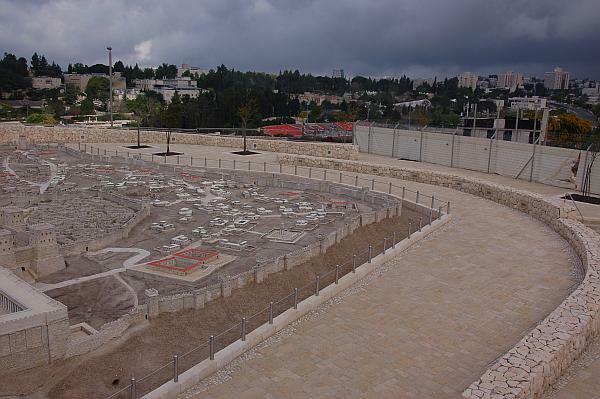 The red-roofed houses are where the Sanhedrin lived. The temple is in the lower-right corner, with its doors facing east. 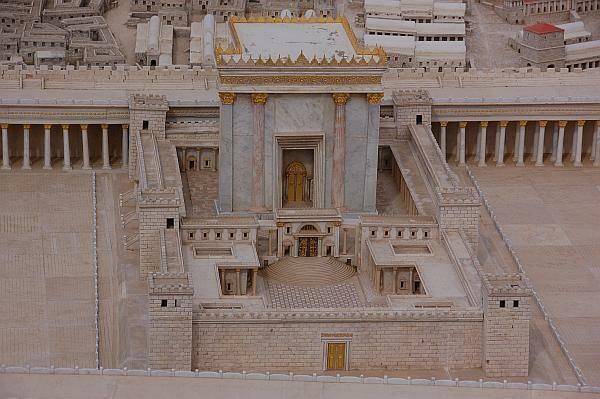 The temple, with the Antonio Fortress on the northwest corner of the temple mount. 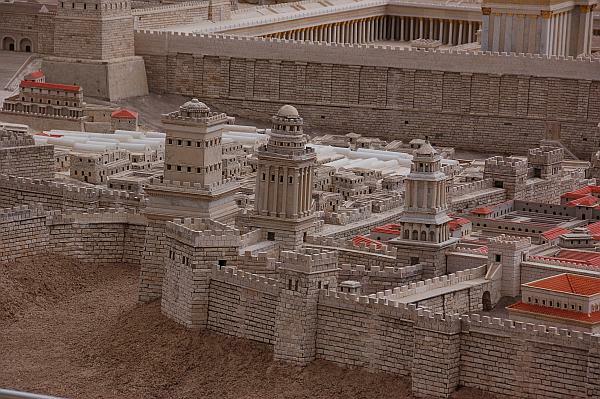 You can see the Golden Gate (aka Eastern Gate) on the wall right in front of the temple.Herod’s palace is in the back of the model, on the western city wall. 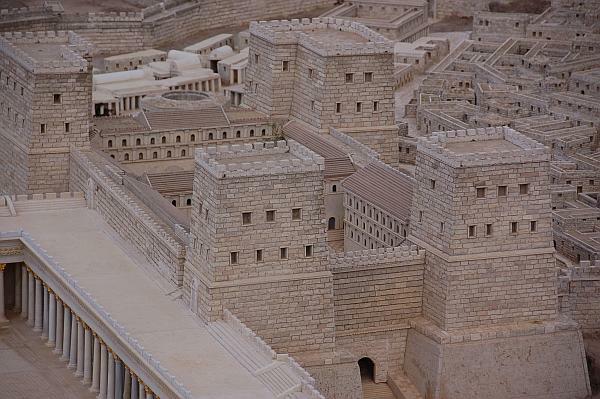 The pool of Bethesda would be around where the red squared building. (I don’t remember if that’s it exactly or if it’s right near the red-roofed building). Close-up of the temple as it was in Jesus’ day. Pretty impressive! The old City of David. 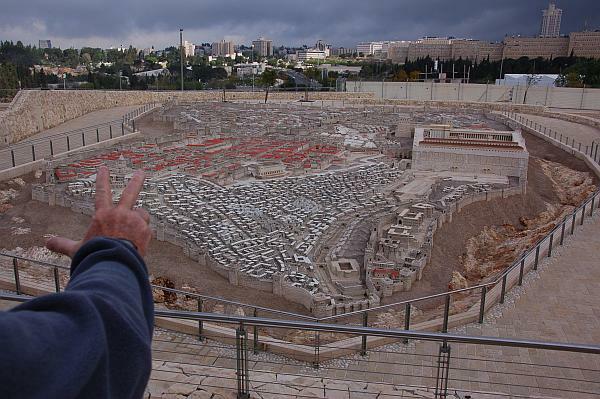 Dr. Dave demonstrating an easy way to remember the three valleys around Jerusalem. Too bad I can’t remember them! Kidron Valley on the right – represented by the middle finger. Hinnom Valley on the left – represented by the thumb. 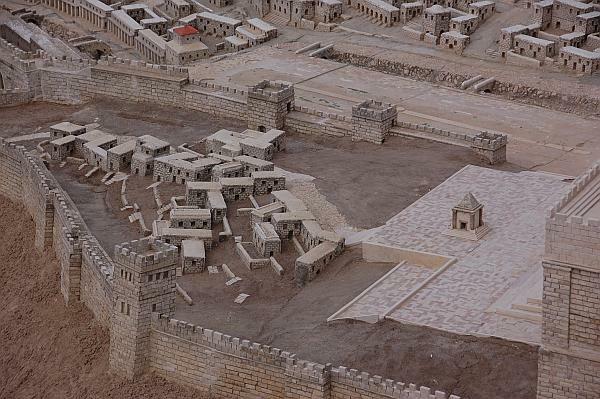 The Citadel Towers was immediately north of Herod’s Palace (red roof in the lower right corner of this photo). The Citadel Towers are still standing today. But not all of it.